Leaders Life, its management, employees, and stakeholders believe in the value that insurance products bring to families in securing their financial future and in taking care of the customer and their needs with integrity, care, and hard work. Our mission is to make fanatical fans of our company through world class service and the fairly priced insurance products we offer for the benefit of all stakeholders in Leaders Life Insurance Company, including our policyholders, our employer groups, our agents, our staff and our shareholders. Our Sales Team desires to be a partner in building agencies through integrity, leadership, and innovation with passion for our customers. Leaders Life Insurance Company began as the vision of our founder, Burt B. Holmes. Burt, a life-long Tulsan and business entrepreneur, has over 50 years of experience in insurance sales through his ownership of the Holmes Organisation. Burt’s entrepreneurship has been best evidenced by his vision of local convenience shopping as a co-founder of QuikTrip Corp., one of the best run convenient store chains in the mid-west and southern United States. One of Burt’s primary core values is “Take Care of the Customer and the Customer Will Take Care of You”. In 1988 Burt felt the sale of term life insurance to individuals at the worksite was an untapped market in Oklahoma. This driving core value led to the formation of Leaders Life and our flagship product, Lifestyle, was developed. 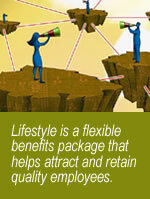 Lifestyle is a term insurance product that has an accelerated death benefit up to age 100. Leaders Life has been among the first in the country to offer this type of product, commonly referred to today as critical illness coverage. The accelerated death feature provides a benefit equal to 30% of the death benefit when the insured is diagnosed as having a major illness such as a heart attack, cardiac surgery (including bypass or transplant), stroke, life-threatening cancer, or a terminal illness where the life expectancy is 2 years or less. This product alone has made Leaders Life a dominant force in marketing individual voluntary life insurance to workers in the state. It has been a market leader in Oklahoma for more than 20 years. In 1999, Burt felt that an important element was missing for Leaders Life. At QuikTrip his partner, Chester Cadieux, was the key operational and financial element of their success. This element was missing at Leaders Life. After a brief search he became acquainted with Russ Angell who not only had the operational, financial, and technical experience from years at BlueCross/BlueShield of Oklahoma but, more importantly, shared Burt’s core values regarding focus on customers. Today Leaders Life markets an expanded arsenal of employer based voluntary insurance products in 8 states (OK, TX, AR, KS, MO, SD, AL & LA) servicing over 700 agents and brokers and 1,400 employer groups. In 2009 the company added Wage Protector, a voluntary short-term disability income product. Since that time Leaders Life has added VGTL/VADD and voluntary group accident to its Lifestyle family of products.